Pioneers in the industry, we offer graha gochar ki sarthak abhivayakti, transit influences of planets, interpretation of planetary transit, encyclopedia of vedic astrology planetary transit and interpreting planetary influences astrology books from India. We offer Graha Gochar ki Sarthak Abhivayakti to our clients. This book deals with Tips for predictive accuracy, rectification of birth charts (through transit), case studies, dreaded concepts of Manglik & Sade-Sati discussed, application of remedial measures. This book is a comprehensive volume based on vedic classical principles.The earlier chapters give in brief the basic principles of Astrology such as significations of the houses, planets and signs, followed by general considerations of benefic positions and the obstructions (vedha) therof. 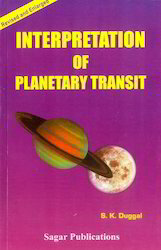 A detailed explanation of transit of various planets has been provided. 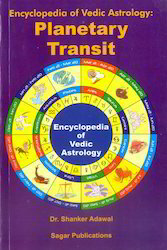 The later part of the book deals with important aspects of transit like Moorti Nimaya, Nakshatra Transit, role of Ashtakavarga in transit and the most effective tool known as Sarvatobhadra Chakra. 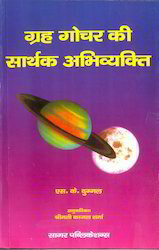 In this book the author has tried to explain effects of transit of inner and outer planets, influence of ashtakvarga on transit and preparation of various Vargas. Result of retrograde planets in transit, Transit and Eclipse fructification of events with the help of double / triple transit and synthesis of dasha and sarvatobhadra chakra. Use of transit in birth rectification, longevity, progeny, marriage calculation etc. various factors which modify transit influence have also been discussed. We offer Interpreting Planetary Influences Astrology Books to our clients.